A topical sermon is a sermon developed from a bibical principle or truth. A biblical principle or truth could relate to God's love, God's grace, God's forgiveness or God's salvation. A topical sermon develops a topic from a biblical truth or principle by looking at it from a perspective or angle. For example, you may want to look at the Depth of God's Love or you may want to look at How To Receive God's Grace or you may want to look at The Nature of God's Forgiveness or you may want to look at God's Plan For Salvation. In Philippians 2:1-4, you will find the biblical principle of unity. In this passage of Scripture, the apostle Paul encourages the Christians at Philippi to dwell together in harmony. You now have a topic you can preach. Dwelling Together In Harmony! The apostle Paul informs the Christians at Philippi HOW they can dwell together in harmony. The HOW question gives you three sub-points. (1) Having a unity of focus, (2) having a unity of thought, and (3) having a unity of purpose. You now have a preaching topic with three sub-points. Your sub-points flow from your preaching topic and expand and explain your preaching topic. 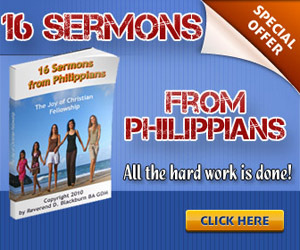 Preview 16 Preaching Sermons From Philippians by clicking on Preaching Sermons. In the topical sermon above, you have a preaching topic with three sub-points. 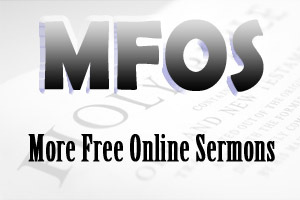 You have linked the preaching topic with the three sub-points by using the HINGE word principles. The hinge word must be a plural noun. Next you draw out any incidental sub-points that flow from, explain or expand the major sub-points. Your sermon now has a preaching topic, sub-points, and incidental sub-points. To finish your topical sermon, you will need to put content to your sermon outline, you will need to write an introduction and a conclusion. When it comes to writing topical sermons, you simple need to develop a topic from a biblical principle or truth by looking at it from some perspective or angle. Once you do this, you will be able to write topical sermons with ease. QUOTE by Bryan Chapell: People have the right to ask, "Why did you tell me that? What am I supposed to do with that information? All right, I understand what you think - so what?" The healthiest preaching does not assume listerers will automatically see how to apply God's truths to their lives; it supplies the application people need. If even the preacher cannot tell (or has not bothered to determine) how the sermon's truths relate to life, then people not only are unlikely to make the connection, but also will wonder why they bothered to listen (Christ-Centered Preaching by Bryan Chapell). QUOTE by Charles W. Koller: Preaching without notes is largely a matter of structure ... without sound structure, a real message may prove obscure and impotent ... sound structure will add immeasurably to the power of a sermon and good homiletical habits are a priceless resource to the pulpiteer ... an outline that stands out clear and sharp is the first long step to freedom in the pulpit (How To Preach Without Notes by Charles W. Koller). QUOTE by James Braga: The conclusion is undoubtedly the most potent element in the entire sermon. If it is poorly executed, it may weaken or even destroy the effect of the preceding parts of the discource. But some preachers forget the importance of the conclusion with the result that their sermons, which otherwise are carefully and thoroughly prepared, fail at the crucial point. Instead of concentrating their material into a burning and powerful focus, they allow the current of thought to be dissipated by commonplace or feeble remarks at the close (How To Prepare Bible Messages by James Braga).